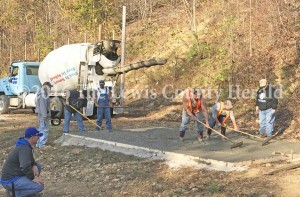 Volunteers and members of the Lewis County Shooting Sports Club and Lewis County Friends of NRA have been working on the second phase of a public shooting range just south of Vanceburg. The National Rifle Association recently approved a grant that will pay for the completion of the project. Judge Executive Todd Ruckel said progress on is being made and he is proud of the efforts to get this phase completed.